The perfect form in sound and design : For those who want something more from their piano, the CEVIANO AP-420 is the perfect choice. The elegant, stylish and modern appearance of the AP-420 is a source of inspiration to any player. Combined with versatile modern features such as USB interface, SD Card slot and line-out, the CELVIANO is highly recommended as the ideal training instrument for piano pupils and sutdents. The Celviano line of pianos has been refined for those who demand an authentic grand piano experience. The new AP-420’s traditional design houses new stereo grand piano sounds and enhanced “Ivory Touch” keyboard. Utilizing a new tri-sensor spring-less 88 note scaled hammer action, every nuance and detail of your performance is captured. A new 4 layer stereo grand piano sound delivers a natural, expressive and dynamic piano experience. 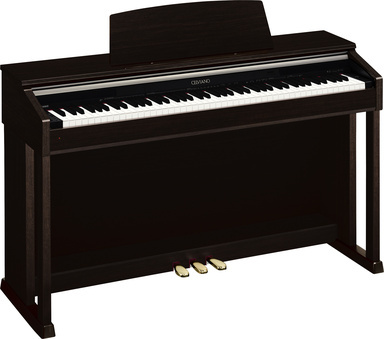 The AP-420 features a total of 16 built-in tones, with the ability to layer two sounds or split the keyboard to allow a bass sound in the left hand. Its built-in SD card slot allows you to load and save song files and the dual 20W speaker system delivers a sound that will resonate through your home. With 128 notes of polyphony, USB MIDI, Duet Mode, 1/4” audio outputs and more, Celviano’s advanced technology and sound will make the AP-420 the perfect addition to any home. The excellent AiF Sound source produces 16 top-quality tones, which truly come into their own in both classic piano repertoire and many other genres. Tri-Sensor scaled hammer-action keyboardPiano feeling: The scaled hammer-action keyboard with 88 touch response, weighted keys is based on the keyboard of a concert piano and provides an authentic playing experience. A third sensor in the keyboard allows players to use particularly fast techniques without the notes sounding unnaturally cut off. With the sequencer (2 track/1 song), you can record your own ideas quickly and easily in real-time (capacity: 5,000 notes). Piano sound tailored to your own taste: The piano setting key switches to grand piano sound at the touch of a button. Two settings are available: "classic" for a soft, discreet sound and "modern" with a more lighter, brighter character. High-quality DSP effectsThe AP-420 digitally reproduces the high-quality sound of a top concert grand piano complete with first-class reverb effects. The simulation of the resonating strings that is provided by the "Acoustic Resonance" CASIO effect rounds the sound experience off perfectly. Listen, sing along, play along: 60 top quality songs are stored on your AP-420. Live before an audience or at home in the living room: The sound diversity of your keyboard is enhanced by 4 reverb / 4 chorus effects. Ideal for lessons: the new duet functions allows teachers and pupils to play parallel to each other. The AP-420 can be divided into two keyboard areas, which can be transposed individually. Safe: With the PANEL-Lock function, the control panel is protected from unintentional moves while playing. Keep to the beat: The integrated metronome helps you keep to the rhythm. The AP-420 features a 3-pedal unit with expanded damper capability. Impressive sound: The powerful two-way system with four speakers and 2 x 20 watts of output power ensures an exhilarating sound delivery. The sound is not only projected in the direction of the player but also to the rear or downwards, depending on the model. This creates a three-dimensional and more natural sound. The innovative SD memory medium offers a simple but limitless way to expand the internal song memory of the AP-420. The USB/MIDI connection enables further Midfile songs to be loaded into the internal memory via the "Song expansion". The memory capacity is 65 KB, enabling up to 1 song to be saved. No software installation from a CD-ROM required thanks to Plug & Play and the USB driver is compatible with both Mac and Windows (from Mac OSX and Windows XP/Vista). Unit weight w/stand 82.2 lbs.